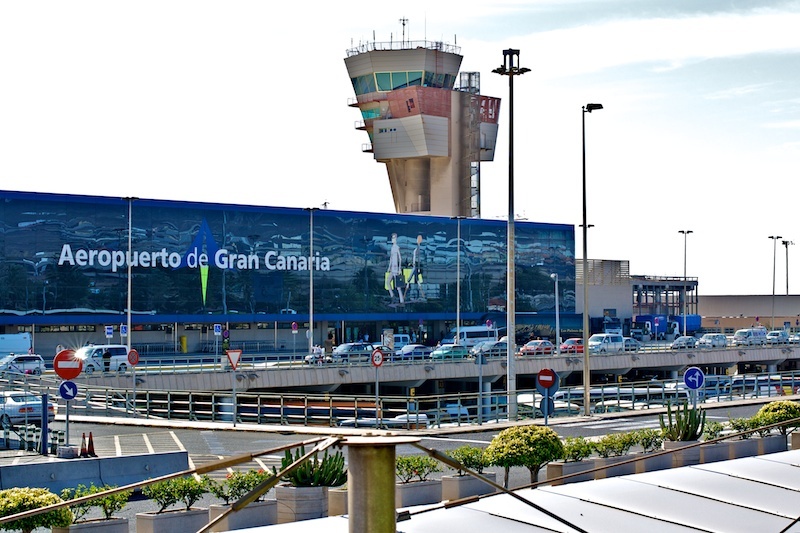 Gran Canaria inhabitants usually call the Las Palmas Airport "Aeropuerto de Gando". The official IATA-Airport-Code for Las Palmas Airport Gran Canaria is LPA "Las Palmas Airport", the spanish airport-company AENA often uses only the phrase Gran Canaria Airport. "Gando" ist a village, part of the city of Telde, the second large city of Gran Canaria in the airports proximity. Not only the International Airport Las Palmas in Gran Canaria is situated there, the military TELDE AIR BASE, has its runway directly beside of the civil runway. Both airstrips have an comfortable overall length of more than 3000 meters and will be amplified in the near future. The most used heading for approach to land and take off is heading north against the prevalent northern winds. The Airport Las Palmas is not directly situated in the city of Las Palmas but rather in the middle of the distance between Las Palmas capital city and the southern Gran Canaria resorts San Agustin, Playa del Inglés, Maspalomas, Puerto Rico and Mogan. To leave the airport you can opt between Bus, Taxi or airport transfer services which need about 20–30 Minutes to Las Palmas city (about. 24 km until Santa Catalina beach Zone) or between 20 and 50 Minutes from airport to the southern resorts (nearest San Agustin, farthest Mogan). The Gran Canaria Airport is situated directly alongside to the expressway GC 1, reason why you can reach the airport always very fast and easy. 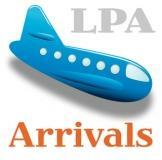 Arrival in Gran Canaria and no transfer from the airport to the Las Palmas Hotel is booked? Not any problem, if not incoming at midnight the easiest and of course the cheapest option is the bus transfer to Las Palmas or Maspalomas. Check the Gran Canaria bus timetable with arrivals and departures at the upper bus stop. Reliable Holiday transfers to the city of Las Palmas or to your southern beach resort in Playa del Ingles, Maspalomas, Puerto Rico or any other location can be booked directly here without extra fee. Of course you’ll arrive also at your destination by taking a taxi or renting a car right from arrival hall at one of nearly 10 rental car services at the airport Las Palmas. Airport Taxis: At present a taxi ride to Las Palmas amounts about 32 Euro, to Maspalomas arround 40 € – surcharges are taken for nightly or sunday rides, bulky goods, etc. Check our Gran Canaria Airport Transfer rates and pay less than a standard Taxi, but getting better cars & service, child seats and vans or microbuses for more than 4 passengers or bulky luggage. Take Global Bus number 60 or 66. They leaves in front of the entrance to interantional flight departures terminal, upper level. Global Bus number 60 daily plies between 06.15 a.m. and 11.30 p.m. each half hour. In any case you’ll come herewith to "San Telmo" bus terminal in the old town. Every second drive also heads to "Parque Santa Catalina". For the route from Maspalomas to airport Las Palmas or inverse take line 66, Faro Maspalomas – Airport Gran Canaria. Look at our Gran Canaria Bus timetable. Car Hire at airport Las Palmas. There are several Airport Car Rental offices, but be prepared to queue in a remarkable line, waiting up to 1 hour, to get your car at this car-hire counters. We offer also car rentals with personal handout, no need to line up then. Gran Canaria Limousines-Service: When preferred something more luxurious a draft on a Limousine-Service can be arranged. Some car rental services provide this kind of service or rather mediation to an applicative service provider. Interested? The Las Palmas Airport of Gran Canaria receives about 10 millions of passengers per year. More than 115.000 flights per year are connecting Gran Canaria with the world. Most european flight connections to and from Gran Canaria are maintained with UK, Germany and Scandinavia. National flights are heading mostly to Madrid (Barajas) and Barcelona, but also there are weekly direct connections to Malaga, Sevilla, Santiago de Compostela and some other spanish cities. Also the inner-canarian air traffic is important with temporarily hourly flights from Gran Canaria to Tenerife, Fuerteventura and Lanzarote. Flights to La Palma Island und El Hierro Island are less frequently. Finally there are existing some attractive non-stop flights from Las Palmas to Morocco, Western-Sahara and to Mauretania. Also Madeira, Cabo Verde Islands and Dakar are connected with weekly flights. klick at the departure or arrival-symbol to check flight scheduling for departing and incoming flights. 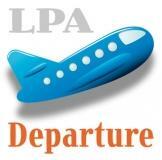 LPA-Airport Info about Terminals, transfers, shuttle- & bus services, Taxi or car hire. Telephone numbers for flight info, luggage & lost & found office. comfortable & efficient private transfers: Nonstop from airport to your Gran Canaria holiday resort: Our popular Las Palmas-24 airport transfer service awaits you personally and drives you nonstop per Limousine, higher class Mercedes Benz Taxis or van / microbus to your final destination. Warranted flat rates, cheaper & better than regular Taxis from the line up! No taximeter-tricks, no ripp-offs, no detour, no surprising supplements! Book easy, pay only directly to the driver !!! cheap flat rates for families & groups in private non-stop buses ++ also available for private excursions!! NO supplements for bulky luggage, child-seats, nightly pick-up!! Departures board from Gran Canaria Airport in-time? Cheap Flights to Las Palmas & Gran Canaria Charter deals heading to Las Palmas Airport you will find on our Gran Canaria Flight Deals Section. (also via left navigation accesible). We intend to present you the widest overview of Charter Flight deals, Low Cost Carriers. low fares and reduced scheduled flights offers available.